Home» Road Tests » Chrysler Delta Contract Hire & Leasing Review. Chrysler Delta – Badge Engineering at Its Best? There is something about Italy. It’s a great place to go on holiday and if you don’t mind pasta, pizza and the odd glass of Pino Grigio, it’s not a bad place to eat and drink either. Outside of that, opera, romance, gondolas and expensive clothes all help to build the picture, but there is one thing the Italians do like nobody else and that’s they design and build beautiful cars. Ferrari, Lamboughini, Maserati and now Pagani are all mega desirable Italian brands, but what about the cars us normal folk might afford to buy? Well Italy’s oldest car maker established in 1899 is Fiat and its still the countries biggest, churning out over 2 million vehicles each year and in the process, owning both a couple of the supercar brands, Ferrari and Maserati and for the more down to earth amongst us, Alfa Romeo and Lancia as well. Always remaining available outside of the UK, it was Fiat’s intention to re-launch the Lancia brand into the UK in 2009/10 and the planned date and would coincide with the launch of the newly revived 3rd generation Lancia Delta. A tough global market however put paid to that, and the UK launch never took place leaving us “Lancia-less” for over 17 years now. Not all is lost however, because following Fiat’s acquisition of US car giant Chrysler in 2009, the door has again opened for the Lancia Delta to come to the UK, albeit, to do so, its got to change its name and wear a Chrysler grille and be sold via Chrysler dealerships, but never the less it signifies the UK return for what is effectively, a Lancia product. Whilst you might wonder about the wisdom of getting the glue out and re-badging the Lancia Delta as a Chrysler in the UK, the Chrysler name is itself a brand which is in need of reinvigorating as frankly, its past UK offerings haven’t exactly hit the spot, remember the ‘Neon’ or the quirky ‘PT Cruiser’? or perhaps I should ask you if you can describe a ‘Sebring’ in 15 words or less or come to that if you know anyone that owns a Chrysler ‘Crossfire’? It’s not all bad though because the Chrysler ‘Voyager’ takes the people carrier to a serious level and still rates as the worlds most popular MPV, whilst the classically designed ‘300C’ remains an impressive looking thing even 7 years after it was first launched and being honest, there is still nothing that quite compares or even comes close to offering the regal appearance of the 300C for its bargain basement price. However, man can’t live on Voyager and 300C alone and if Chrysler is going to become a serious mainstream contender again in the UK, it needs a mainstream car, hence the Delta, which Fiat hope will establish Chrysler as a European brand offering products that better suit this market and slaying the conception that everything Chrysler is USA product, built for their market and not ours. The Chrysler Delta has now been followed by the 3rd generation Lancia ‘Ypsilon’ which will also be badged Chrysler and is a much smaller hatch, but it still manages to squeeze 5drs into its pretty looking body. Underneath, the Ypsilon it’s got the mechanicals of the Fiat 500 with an extra 90mm inserted into the wheelbase to give it a roomier interior. We will be reporting on the Chrysler Ypsilon shortly, but first indications are that it’s a kind of grown up and far more practical Fiat 500. So what is the Chrysler Delta? Well it’s a 5dr hatchback (a lot like a Focus or a Golf), it’s based on the Fiat Bravo and Alfa Romeo Giulietta (both decent cars) and I guess simply offers something a bit different, although realistically and in all honesty, its going to pretty much be the same to drive and live with as both of its Italian chums. The claims are that the Chrysler Delta offers the space you get in a family saloon car, but its fitted into a compact hatch body (where are Pen & Teller when you need them) and the trick is performed by the rear seats, which slide back and forward so that you can decide on how much rear legroom you want and whilst that might seem a bit of slight of hand, the fact is that even when the rear seats are as far forward as possible, the Delta still offers a class leading 907mm of rear legroom, so the tricks definitely been pulled off. There will be four levels of trim on the Delta, the ‘S’, ‘SE’, ‘SR’ and ‘Limited’. Engine wise its 4 choices include a 1.6 and 2.0 Multijet diesels, a 1.4 Turbojet petrol and an impressive 140ps 1.4 MultiAir unit. Everything gets 6 speed gearboxes and there will be a semi-automatic version available in the 1.6 SE Multijet diesel. Chrysler products have always offered good value for money and lots of sophisticated safety stuff is standard on the Delta range including, Electronic Stability Control, Electronic Brakeforce Distribution, ABS, Daytime Running Lights, 6 Airbags, 3 Point Safety Belts for all 5 seats. Other wizzy stuff includes Hill Holder and Anti Slip Regulation traction control incorporating Linearisation Torque Feedback, Torque Transfer Control, Driver Steering Torque, all of which I am reliably informed are there to improve the cars handling. As for toys, and as you might expect from an Italian builder, even the lowest spec car gets some nice bits such as Radio/CD, MP3 Compatibility, Front Fog Lamps, Air-Conditioning, Electric Windows Front and Rear, Remote Keyless Entry. Chrysler kindly loaned us a Delta so we could see for ourselves and the Delta is actually a nice thing to drive and whilst it’s perhaps not quite as responsive as a Focus, or as refined as Golf, it’s not half bad and is really quite a pleasurable place to be. As pretty much the biggest car in the C-segment, its long wheelbase gives it a stable and smooth ride yet in town its quick-geared steering makes it easy to manoeuvre and park despite its length. Our car had the standard 6-speed gearbox which we also found both light and precise. On the road, if we have one slight criticism, its not really one that we can blame the car for. Whilst we’ve only driven the one Delta, our car was really quiet, with hardly any mechanical noise or wind noise and that meant that on smaller less cared for roads that we could hear the road noise, simply because the Chrysler Delta was so quiet. Chrysler figures for the Delta say that the combined average fuel consumption is 60.1mpg and it can run from 0-60 in just 10.7 seconds and on up to 120mph, whilst having Co2 levels of just 122g/km and that’s a pretty good all round combination, which is bound to appeal although we didn’t have the car long enough to run the tests for ourselves. When pictures of the Delta were released, it came in for some flak because of its modern styling with extrovert swoopy lines and steeply raked side windows and a strange shaped front grille which looks a bit like the shape of a “Blue Peter” badge, or should I say shield for the uninitiated. That said, it’s an attractive quirky car that’s a little left field and a touch out of the mainstream and the more you see it, the more attractive it becomes. 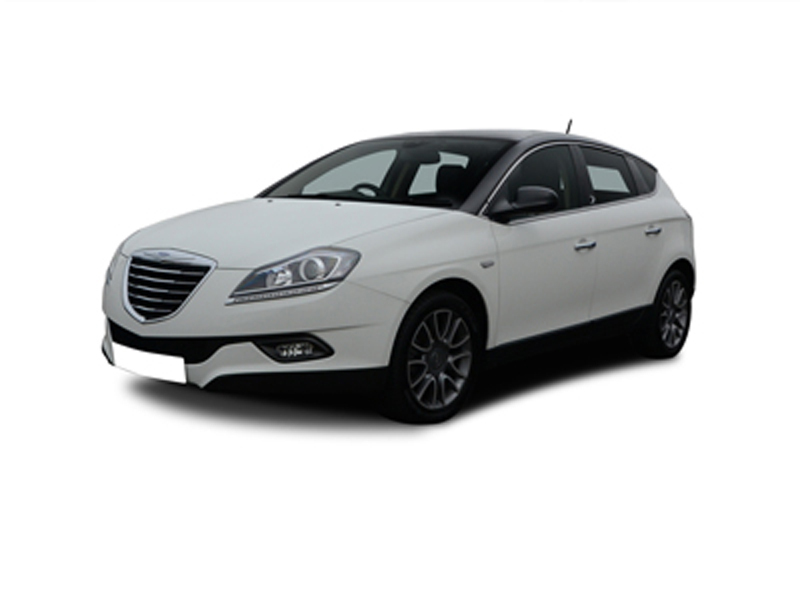 In conclusion, it’s going to be about choice realistically and if you fancy a Focus, or an Astra, well that’s what you are going to have, but if you are open minded enough to take a look at something else, the Chrysler Delta has to be on that list. The Delta is a big little car and has great internal space, drives nicely, seems well put together and is refreshingly different if not exceptional, but its built using the same components that figure in most other Fiat products so it should do a proper job for you. If there is a question, it surrounds the cars brand name and if, when you come to sell it, will the Chrysler badge will be one that used buyers are searching the classifieds for? Optimistically, the Chrysler Delta will be a good enough car to re-establish the cache of the Chrysler brand in this sector of the market and this shouldn’t be an issue, but for sure, it’s something you have to consider. For a quotation on the new Chrysler Delta, or on any other Chrysler, please contact us.